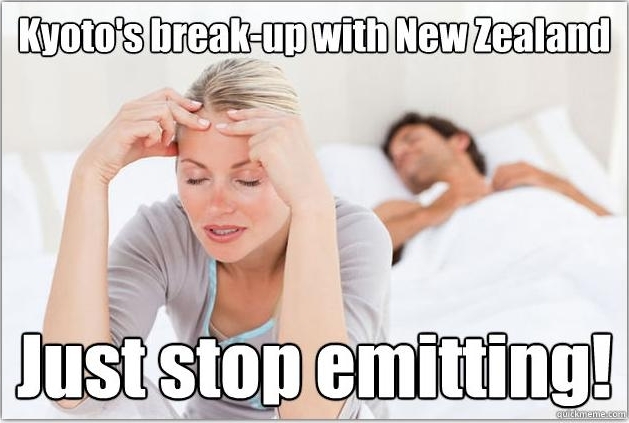 I have argued before that New Zealand did not sign the Kyoto Protocol in good faith. As we seem unable to commit to Kyoto stage 2 in good faith, I have had another look at how faithful New Zealand’s position was at the beginnings of Kyoto and at ratification in 2002. MFAT were saying: (1) New Zealand’s greenhouse gas emissions would increase (not reduce) through to 2012. (2) New Zealand would meet its Kyoto target by issuing itself additional forest sink removal units. (3) New Zealand would make an economic gain from having a surplus of emission units. 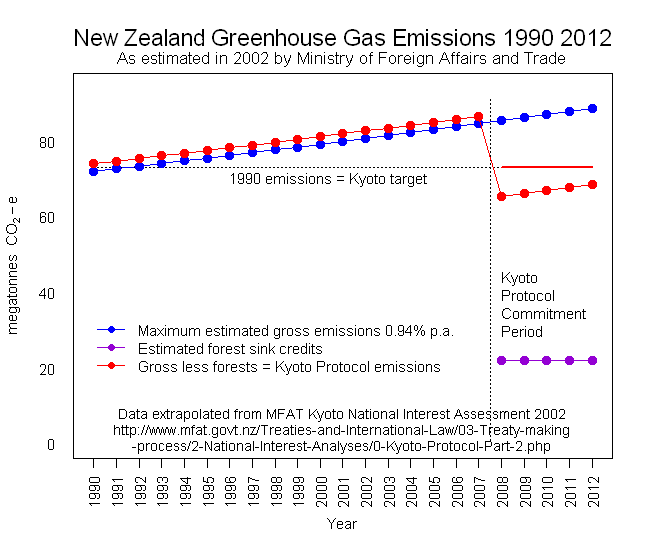 So New Zealand would meet a ‘trifecta’ of Kyoto-related goals, none of which were reduced gross or net emissions. So what would MFAT’s predicted increased emissions and forest removal units look like on a chart? If I assume that the emissions growth in the maximum scenario (an additional 75 million tonnes of carbon dioxide equivalent greenhouse gases) is represented by a linear increase of 0.94% p.a. from a base of 73 million tonnes in 1990, and the forest removal units are issued equally over 2008 to 2012, it looks like this. This is what ‘gross-net Kyoto accounting’ of emissions looks like. From 1990 to 2007, gross or total emissions (blue dots) are the same as “Kyoto” emissions (the red dots). However, from 2008, you get the “Kyoto” emissions by subtracting carbon dioxide removed by ‘human induced afforestation, reforestation and deforestation’ (the violet dots) from the gross emissions. And the red dot Kyoto emissions suddenly dive under the 1990 baseline, even though both net and gross emissions have increased. 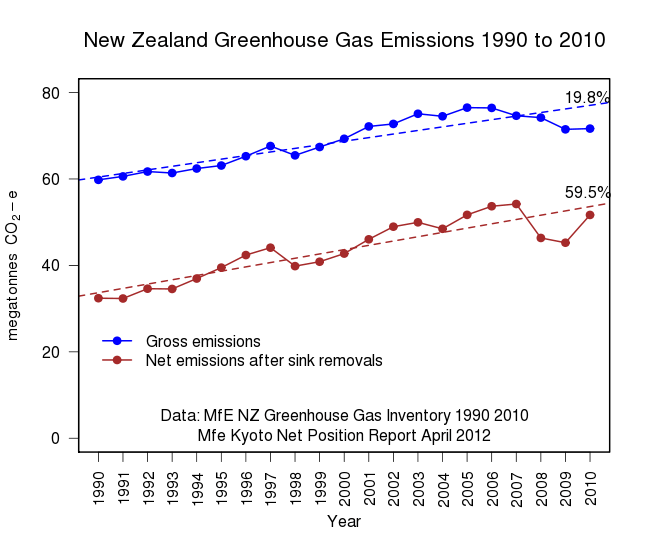 This is why whenever we hear Tim Groser or Nick Smith claim the New Zealand is meeting it’s Kyoto target, we need to realise they are being the ultimate uncommitted unfaithful partner; in spite of their smooth rhetoric of caring about global warming, New Zealand’s gross and net greenhouse emissions are both showing an increasing trend. New Zealand needs to adopt policies that really do just stop emissions. NB The original meme is the Kyoto New Zealand break-up and all the images are at Picasa at Kyoto’s Break-up with New Zealand where they can be viewed as a slide show. Feel free to use them and make up some more.